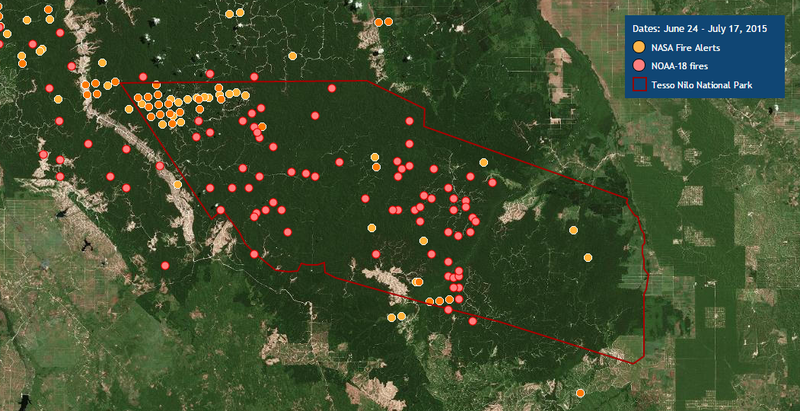 The World Resources Institute’s (WRI) Global Forest Watch Fires is currently being used to respond to a massive outbreak of fires in Tesso Nilo National Park, Indonesia. The fires in the protected area began May 29, 2015 and have continued to burn since. In response, Blue Raster created the maps below using ArcGIS Online and a custom application to analyze the region where fires are burning. Using 50 centimeter resolution imagery along with NASA MODIS fire data, the maps capture the illegal activity occurring within the boundaries of this protected land. GFW Fires continues to be used as a response tool in Tesso Nilo and other parts of the world. Check out the maps, and visit GFW Fires to see the latest on this outbreak.